I am trying to create a model in ModelBuilder (ArcMap 10.2.2), where there is an iteration through rasters in a workspace, each raster is run through a formula in raster calculator and where the output name is dependent on the raster name. As you can see in the picture, I have put an invariable output name %Name%, which should change with each iteration, with a new name coming from the new raster. This does not work however, only the first two iterations change the name, then all following iterations uses the first created namespace. E.g. : If the raster file names are 'a' through 'c', the model will create raster a and b and then overwrite all following raster onto 'a' namespace, overwriting the data. I have also tried using the %n% and %i% variables, with the same result. I have put all rasters in a workspace (geodatabase) that is another than the the currently active one, using ArcCatalog Import-->Raster Datasets... in ArcMap window. The raster file names does only have text and numbers, no spaces or special characters. This post seems to have a somewhat similar problem, although it has not been resolved: Why does inline variable output overwrite occurs with Reorder fields tool? I have also tried to set 'Name' as a precondition for Raster calculator. I have been trying both running raster sets from Workspace (default and other geodatabase (gdb)) and from a Raster catalog, same results. This happens even if I use other tools such as Clip, with Workspace as input for rasters. It gives the same result regardless if I add .tif or not for output file. This answer (by the asker) has been moved from within the question to conform to the Q&A format of this site. To make the iteration work, I had to create a geodatabase and import all rasters I wanted to manipulate. Then I could click''n'drag the gdb into the model. By setting the gdb as a 'Model parameter' the model can be feeded with any other geodatabase and saved into any folder or geodatabase. 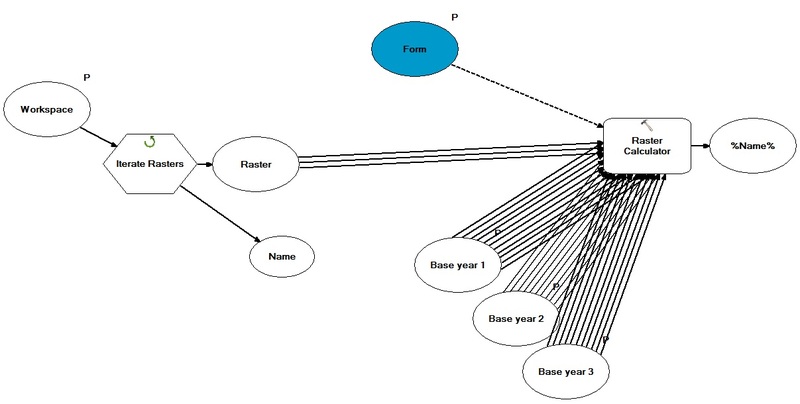 However, if a generic variable 'Workspace' is created, linked to an iteration and then feeded with the same geodatabase, my problem described above will occur. Not the answer you're looking for? Browse other questions tagged arcgis-desktop arcmap arcgis-10.2 modelbuilder iterator or ask your own question. Why does inline variable output overwrite occurs with Reorder fields tool? Iterating rasters in ModelBuilder - wildcard does not seem to work? Why is Modelbuilder Raster Calculator only exporting black and white? Substituting inline variables in ArcGIS ModelBuilder?